Five months ago Bright Eyes started on Sound Therapy for his auditory processing issues. At the time his therapist did two hours worth of testing, provided me with some very smart looking equipment and then presented the bill. I choked a little (as I always do with any bills that have to do with children's therapy) but she quickly reassured me: "I always say to my clients, if it doesn't work for you, I'll give you all your money back." I did feel reassured, and I kept saying to myself this week, as we went back to get Bright Eyes retested, "It's ok. If it hasn't worked, I get my money back." Let me tell you, I don't need to get my money back. His results have been great. Fantastic even. The therapist was very very happy, and I have to say that I have been noticing differences in the complexity of his conversations and in his comprehension, especially in the last month or so. He increased his 'spelling age' from 9.9 to 10.6. 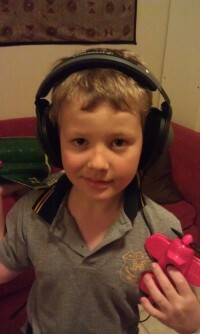 His right ear capabilities increased by a good 20 per cent. I'm happy with this. We're continuing on, as there is still a lot of work to do. He'll still be listening to the therapy CDs for half an hour a day and doing her particular exercises. In the next few months she's going to work on his left ear (= right brain) which should help emotional intelligence. I wonder what changes we'll notice.